The Cu Chi tunnels are a must if you are travelling to Ho Chi Minh City, Vietnam. Whilst the amount of time spent on site isn’t excessively lengthy, the time taken to get here can vary greatly. 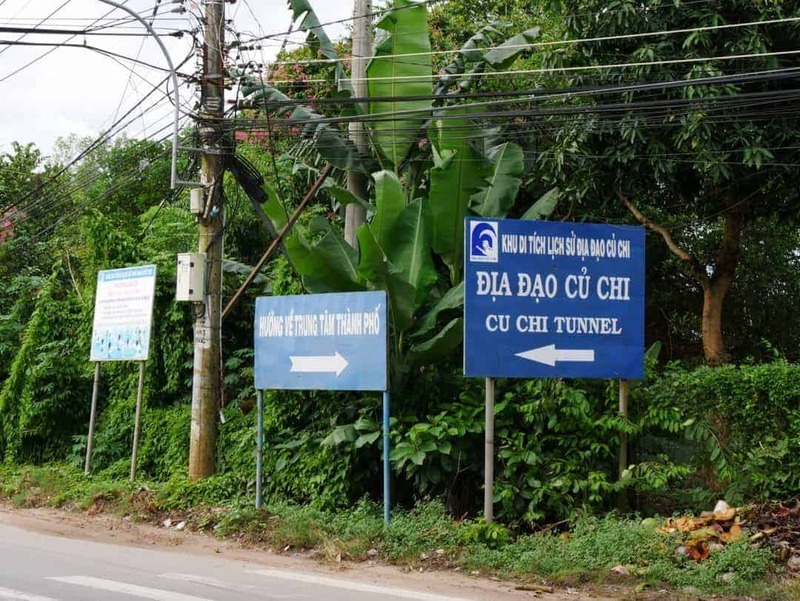 Here’s all the information you’ll need for catching the bus to the Cu Chi tunnels. If you don’t have much time, I’d recommend getting a private car (readily available in Vietnam) or at least jump on a half day tour. The downside to this is that the time is not your own so everything can feel more rushed. Most Vietnamese tours also like to have mandatory rest stops at a strategic location that encourages you to spend money. I don’t have an issue with this, but just understand that it happens. Alternatively, you can take a walk on the wild side and set off on an adventure that will take you all day, by riding on the local buses. The downside of this, of course, is time, but I wouldn’t have missed this for the world. Getting to the Cu Chi tunnels on your own is a great thing to do and I highly encourage it. As the #13 bus rattled over every bump in the road, weaving in and out of the thousands of motorbikes, and as the women’s voices competed with each other at some ungodly decibel, I wondered for a moment whether we had done the right thing. By “right thing”, I mean catching the local bus. As is always the case in Vietnam, there is someone willing to drive you somewhere, anywhere, in an air-conditioned car, or put you on the back of their motorbike. But, in the interests of getting to spend some time in a local’s shoes, we chose the bus. It was all easy enough to do and of course, like so many things in Vietnam, inexpensive. We start our adventure off early, knowing that it will be a long day, and wanting to ensure we had plenty of time at our destination. We’re lucky that our hotel is quite close to the main bus station, so a quick walk finds us on the bus and ready to go. The 15 minutes or so that we sat on the bus prior to it leaving provided plenty of entertainment. The #13 bus. All public buses in HCMC are green. I’d read so much about scams in Vietnam that I was sensitive at this early stage in our trip. When three over exuberant women hustled us on to the bus yelling “Cu Chi, Cu Chi”, I was ready for them. As it turned out, it was a wonderful example of why we shouldn’t judge so quickly, and it settled any feelings I had of scams almost immediately. This was after all a locals bus, and these ladies were simply women who wanted to help. Besides, they spent the entire 1.5 hours of the first part of this trip talking over the top of one another and sharing mobile phones that they wouldn’t have had a chance to scam anyone :). When the bus finally creaked into action (they’ve seen better times), we had barely gone a block when it stopped and the ticket lady ran off the back of the bus. Shortly thereafter, she returned with a bowl of steaming beef pho purchased off a street vendor, along with something wrapped in a banana leaf. The pho got handed off to the bus driver, who took advantage of every traffic light stop to sit cross-legged (and shoeless) and slurp on his pho. The ticket lady, deciding that the banana leaf was surplus to her needs, promptly reached across another passenger to throw the banana leaf out the window of the moving bus. I’m quite certain an unsuspecting motorbike rider found something extra on their helmet that morning! This kind of activity continued until the Cu Chi bus station. We are immediately accosted by half a dozen gentlemen in blue shirts as we got off the #13 bus. They were trying their best to get us to go with them on their motorbikes at heavily inflated prices. Note – when I say inflated, I mean more than what it would cost on the bus. In relative terms, the cost really isn’t that high. The second bus trip takes another 1.5 hours to get to our destination. I’m thankful that we took plenty of water, as even though the buses are air-conditioned, it’s still quite warm. It’s about a 5-7 minute walk from the main road to the ticket hut inside the grounds of the Ben Duoc tunnels. Here’s how you can get to the Cu Chi tunnels on the bus. These instructions have also been well tested by many of my readers who have all written to tell me they found them without any problems thanks to these details. Note: There is other published information which is inaccurate or out of date. Note the name of the bus station is 23/9, not 24/9. It is located in the backpacker area of Ho Chi Minh City. The #13 bus also commences and terminates here, not at the Ben Thanh bus stop. Tickets can only be bought on the buses with cash. They seemed to always have a wad of money with them, so getting change wasn’t a problem. You can take food and drink on board. Water is recommended as they don’t stop anywhere along the way. Tip: We sat at the front of the bus so that we could keep an eye out for where we needed to get off. There is a T intersection with blue signs to Ben Duoc or Ben Dinh. If you are wanting to get off at Ben Duoc (as we did), then you get off just around the corner, in front of a small store. If you have any concerns, be sure to ask the bus driver, but remember they won’t usually speak English. Ben Duoc is pronounced Ben Zhu. The signs to watch out for at the T intersection. Get off here for Ben Duoc tunnels. To return back to the city, this process is simply repeated in reverse. Tip – We caught the bus out to the tunnels at around 8 am and left on the #79 bus on the return journey around 3 pm. Doing so allowed us to avoid all the crowds. There are stories of standing room only during peak hour. I can believe this as toward the end of our return trip the bus started to get quite busy. Standing up and being cheek-to-cheek with other passengers might be rather testing, so get out there early. Download an app for buses in Ho Chi Minh City. We know this is a great ride, and we know the directions and details work. Why? Because we’ve been there, done that, and done it exactly this way. But, if you’re still not sure, here’s what Carole, a recent traveller had to say to us. I know, you thought no-one used guidebooks anymore, right! But I saw so many people walking around Vietnam with them. If you are looking for a guide, why not pick one up here. Great recap on how to get to the Cu chi Tunnels. I have not been, but find your step by step information to be helpful. Great tips on avoiding the crowds. It’s true.. if you get around in the morning, you can often experience a lot of things without a crowd. Taking local transport is always an adventure and such a great way to interact with the locals/save money! I love your reminder not to judge too quickly. I have found that, in most places around the world, people are generally helpful and willing to look out for you. Sounds like an adventure for sure! I like the idea of taking local transport as you get to see more of everyday life for locals. Glad this post didn’t involve any scams. I am starting to get paranoid about them but I realize that they do happen a lot so it is good to be on the look out for them. Thankyou for the tips! The local buses do sound like quite the adventure – it’s those experiences which are most memorable though and most amusing to write home about – you miss out on all the action when you jump in a private car; haha gotta love that the motorcycles were more expensive than the bus itself! The bus trip sounds a little similar to bus trips in Fiji! You definitely feel every single bump in the road…it is quite an adventure! I remember catching buses in India and it gives you quite an interesting glimpse into local life, don’t you think? couldn’t agree more Juliette, that’s why we do it. Maybe not every time but at least once. This is such great advice for people who have lots of time while traveling. I saved so much money by taking public buses in Indonesia and it made me wish I had information like this post for other destinations. I’ll be taking the #13 bus for sure next time I go to Vietnam! That bus driver is basically my spirit animal! He looked so cozy and comfortable. I do wonder was he a nice guy? He looks so chill, not as tense as one of the bus drivers I’ve encountered! By the way your pictures are sooo beautiful! What fantastic and detailed tips. These types of posts always help so much when I am researching and planning a destination. Vietnam is somewhere I intend to go for sure. My brother and sister LOVED it! I did something similar in Mexico. I wanted more time that the day tours to the Sun and Moon temples offered plus I wanted lunch in a cave. I just found the bus station and took a bus down there. It was a fun adventure and I enjoyed getting to take the local transport as well as having more time at the site. Sounds like quite an adventure to ride the bus to the tunnels. Nice that it is only 1.5 hours on the bus. Hi, it’s actually 3 – 1.5 to Cu chi and then another 1.5 to Ben Dinh. I love your descriptions of the people on the bus. And I’m sure one of those motorbike riders got quite the banana leaf surprise that morning! Super helpful info here, and it sounds like an experience you won’t soon forget! Thanks so much Khansa, greatly appreciated. Great detailed tips! I’m going to have to like print this off if I every visit! I’d definitely get lost without a copy of this! I think I’d prefer the bus over a random motorbike! I’ve yet to travel to Vietnam but it’s definitely on the list. I can’t get enough of their cuisine. I’ve heard of the Cu Chi Tunnels, and it’s always great to read about options to get there and to know what to expect! I love taking local buses – sometimes longer, more cramped, hotter and hideously uncomfortable – but it makes for a great story afterwards 😀 And there always is a story with these kinds of trips, so much more interesting than a taxi! I didn’t make it to the Cu Chi tunnels when I was in Vietnam, as I’ve heard mixed reviews. A lot of friends liked the actual tunnels, but said that people were all around them trying to get them to shoot assault rifles. Did you have that experience? Going to the Ben Duoc Tunnels is not touristy and therefore the whole assault rifle thing is not an issue at all. The subject never same up. At the Ben Dinh tunnels they have a rifle range and I believe this is where the pressure might come from. Thank you so much for your excellent description on how to get to Ben Duoc. Without your blog I would’ve ended up going to Ben dinh. We had no problem catching any of the busses or getting off. The number 13 just stopped at what I guess is a central bus station in Cu Chi. At the same station we got the #79. no one bothered us actually we were immediately ushered towards the correct bus. Our fellow passengers in the #79 made sure we got off at the right stop. Both busses even had WiFi. Hi Ali, that’s absolutely fantastic. Thanks so much for taking the time to come back and let me know. First of all, I am thankful for your inspiring and helpful article. And I would like to ask one question that in case I want to catch the bus num.13 from Ho Chi Minh airport to Cu Chi, is it possible or any bus stop nearby? Buses depart every 15 to 20 minutes and take roughly 50 minutes to get to the Park 23/9 bus station, located near the backpacker district from the airport. This is where you can catch the #13 bus. Thank you very much for sharing your experience and the tips. I followed your guidance today and that was an amazing and authentic moment. All the information regarding bus lines and prices are still up to date. i have one question. so you take bus #13 on Park 23/9 bus station, then you stop on the T Transaction? from there you wait to get bus #79 which stop at cu chi tunnel station? The #13 takes you to a major bus stop at Cuchi Bus Station – you can’t miss it. Then catch the #79 out to the tunnels. When you get to the T intersection there will be signs to both tunnels. This is where you get out. Thank you very much for your detailed instructions and great tips. I followed them for my visit to Ben Duoc today and they worked flawlessly. Price update: The 13 bus fare is now 10000 VND. A minor point about the B52 bomb crater. The B52 was the aircraft that dropped the bomb, not the bomb itself, so while “where a B52 landed” would have been an aviation triumph, I’m afraid not even Sully could have pulled it off! Thanks so much for the update of VND Robert and for you other note which actually isn’t minor at all 🙂 . Thanks so much for taking the time to tell me. Thanks for the info. Travelled there during Tet and so the traffic was quiet and we made good time. Glad we read your report. Ben Duoc and the guides there were really informative. Fantastic Norman, pleased it all went well for you.